The system compressor in Radium is also available as an independent audio plugin. Accurately visualize the sound compression. Rapidly helps you find good compressor settings. 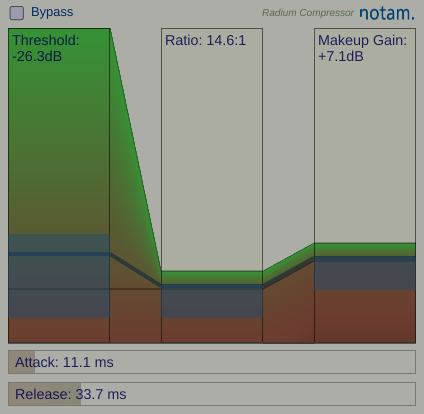 With the Radium Compressor, you spend less time listening and finetuning. The interface quickly makes you find the sound you want. The DSP code is implemented by Julius O. Smith III. Julius O. Smith III is a professor in Music and EE at Stanford University, and he is one of the legends in audio research. The compressor is based on code Julius has written for Faust. Can also work as expander. from the plugin, but it's the same interface.